Enduring for over 800 years on the banks of the River Vistula, Warsaw has emerged as one of Europe’s most vibrant cosmopolitan centers. In the heart of this thriving city is the elegant Warsaw Marriott Hotel, located across from the Palace of Culture, featuring 523 beautifully appointed guest rooms. Our arrival in 1989 sparked a new era for Warsaw hotels, with luxurious guest accommodations providing stunning appointments and conveniences. There are comforts like the new bed from Marriott, with down comforters, designer duvets and fluffier pillows and amenities such as a spacious work area and Wi-Fi Internet. The Holmes Place fitness club provides state-of-the-art equipment for a thorough workout, plus soothing spa treatments. A chic shopping gallery and tempting dining options, including the enchanting Parmizzano’s Restaurant, famous for its fine Italian cuisine and 40th floor Panorama Bar & Lounge with magnificent views. 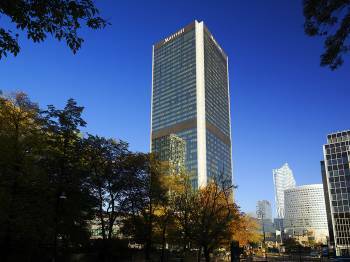 For business and social events, the Warsaw Marriott Hotel offers over 2,600 sq.m. of meeting and exhibition venue. Business events become even more successful in Warsaw’s most stylish, sophisticated landmark. Warsaw Marriott Hotel conveniently located in downtown offers over 2,600 sq. m. of flexible meeting and exhibition space. Total of 21 meeting rooms – most aglow with natural light, and all equipped with the latest technology. Elevated by attentive service and stellar cuisine, Warsaw Marriott Hotel makes meetings more focused, efficient and productive.